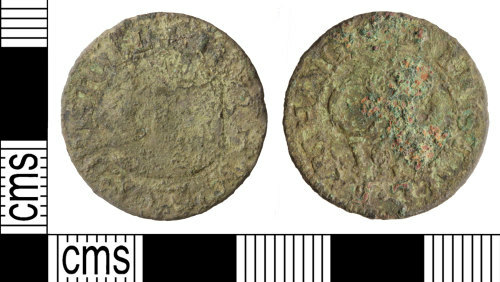 A post medieval copper alloy farthing traders' token issued by the City of Bristol and dated AD 1652-1662 (but probably AD 1652). Obverse legend A BRISTOLL FARTHING depicting a circular border with CB (for Civitas Bristol) above [ ]2. Reverse legend THE ARMES OF BRISTOLL depicting within a circular border a port broadside partial view of a three-masted ship under sail and a fort (Bristol's coat-of-arms). Cf Williamson G C (1889), Boyne's Trade Tokens, Vol 1 Elliot Stock, London (later B A Seaby edition 1967) - see Gloucestershire, p 241, No.12. Obverse description: CB within a circle and beneath that [ ]2. Obverse inscription: A BRISTOLL FARTHING. Reverse description: Port broadside partial view of a three-masted ship under sail and a fort. Reverse inscription: THE ARMES OF BRISTOLL.